In February 1964, The Beatles started the first British Invasion, appearing on the Ed Sullivan Show. They held the top five positions on the US Billboard Hot 100 singles chart which to date, no other act has achieved, and it wasn’t long before other UK bands joined the Invasion. The Rolling Stones would become the biggest band other than the Beatles to come out of this era, topping the Hot 100 eight times. In America, the Invasion spelled the end of the popularity of instrumental surf music, pre-Motown vocal girl groups, the folk revival and the teen idols who had dominated the American charts in the late 1950s and 1960s. 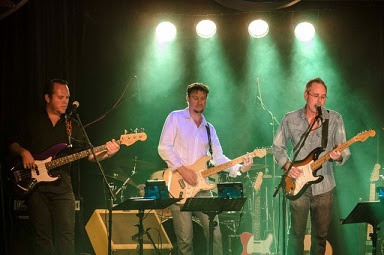 Paying tribute to the artistes pioneering and those who continued with the British Invasion is Durban’s favourite band, The Reals with Barry Thomson on guitar, Dawn Selby on keyboards, Mali Sewell on drums, Jason Andrew on bass guitar and guest guitarist Shaun Dragt. In the repertoire of hit songs from decades 60s through to the 90s, are pop and rock hits from top British bands including The Beatles (I Saw Her Standing There), The Animals (We Gotta Get Out Of This Place), The Who (My Generation), Rolling Stones (Start Me Up), Led Zeppelin (Rock And Roll), Oasis (Wonderwall) and many more! British Invasion shows take place from August 1 to 5 and again from August 8 to 12, 2018. Performances take place from Wednesdays to Saturdays at 20h00 and on Sundays at 14h00.